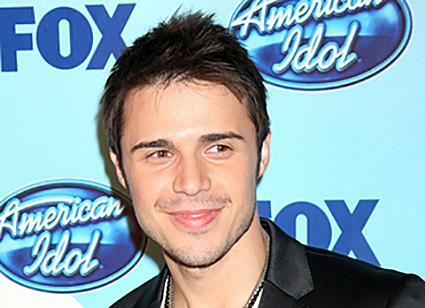 The Kris Allen bio tells the story of a music career that almost wasn't... and how an American Idol upset victory opened once closed music industry doors for Allen. Kristopher Neil Allen, or Kris Allen for short, was born June 21, 1985 in Jacksonville, Arkansas. He took to music at an early age and picked up his first instrument, the viola, in elementary school. By high school, he was playing the viola in his high school orchestra and the all-state Arkansas orchestra. During this time, he also picked up the guitar, piano and a few other instruments, proving himself to have a natural ear for music and playing. After high school, Allen headed to the University of Central Arkansas in Conway to study business, but he couldn't shake the music bug. He dropped out of school to pursue music full time, though he soon discovered how hard it is to make a living playing the local circuit. He took on a shoe salesperson job and worked on his music around his work schedule for a few years. He also self-released a debut album called Brand New Shoes and pressed 600 copies, which he mostly gave away. In 2008, Allen married his long time girlfriend and reached the conclusion that a career in music just wasn't going to happen for him. He made plans to return to school and look for a better job. Then fate stepped in. When the chance to audition for American Idol presented itself, Allen decided he would make the casting call his final shot at making it in music. He attended the open calls in Kentucky with his brother, who did not make the cut. Though the judges picked Allen to go through to the Hollywood round, he was definitely not an early standout. He got little camera time and even was forced into an off-camera sing off with a fellow contestant before the judges would put him through to the finals. It wasn't until the finalists were narrowed down to the top seven that the judges, Simon Cowell in particular, began to notice Allen's talent. As the competition progressed, Allen started drawing rave reviews from the judges on a regular basis. He was able to bring something to the table many of the contestants weren't: he was an all around musician, not just a singer, and so he was able to play along during some of his performances. Even though he was surprising people during the competition, the writing seemed to be on the wall that his fellow semi-finalist, Adam Lambert, was going to take the title. Lambert was the subject of much media coverage and seemed to have a strong fanbase behind him. It wasn't to be, however, and Allen seemed as surprised as everyone when his name was read. The win was not without controversy. Some people speculated that Lambert's homosexuality had a lot to do with why Allen won. There were suggestions that Fox manipulated the vote when someone at the network made a statement that the voting wasn't even close. Eventually, Ryan Seacrest claimed that less than a million votes separated the two contestants but that Allen definitely won American Idol fair and square. Allen did the media circuit after his American Idol win, appearing on all of the major talk shows and news shows. One notable appearance was on Mike Huckabee's Fox News Show, where he performed a Beatles duet with the former governor. His debut single No Boundaries, which was released in May 2009, was the number one song on iTunes the week of its release. Allen also did a small tour after winning Idol, but not at the usual venues. He played a shareholders meeting for the Wal-Mart corporation and performed two songs at Disney World, where they held a parade in his honor. In June 2009, he signed to Jive Records, with plans to release his debut album in the fall of that year.